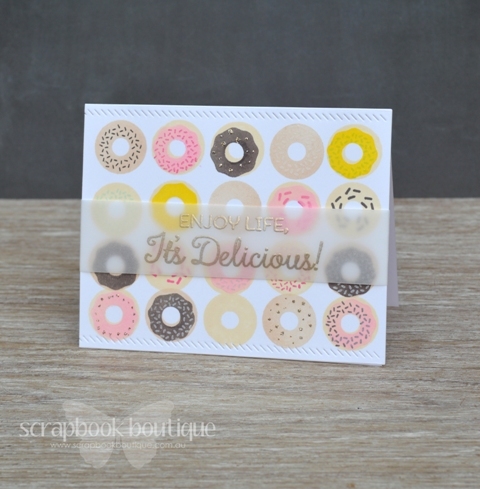 Video : Doughnut’s are delicious at Scrapbook Boutique! Here again with another card for Scrapbook Boutique. Today there are so many doughnut’s in sight I’m starting to feel quite hungry. I filmed as I created so you can watch the process. You can find all the products linked below or head on over to Scrapbook Boutique where there is soooo much more! < Previous CAS Penny Black! Next > Video : Colour with ‘U’ – Blender Pen v’s Markers! Great card Therese, I love how vellum has made such a come back. Its a great way to add a sentiment but keep the picture all there. YUM. Making me hungry for donuts 🙂 Doesn’t help I got a fit bit for Mother’s Day and food like this is off the menu for now until I get to my goal 🙂 Anyway enough of my waffle. Fab card perfectly stamped as always and seriously they look real. I want one with pink icing please. I am sure you had loads of fun, pure stamping goodness. This card is so delicious ! 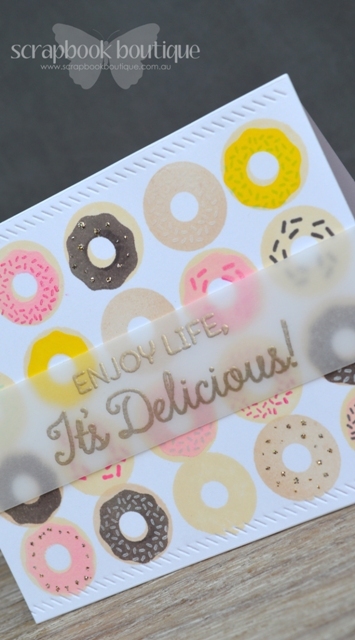 oh my very cute card.. i love the embossing on the vellum and those donuts well they are just too fun..
mmmmmmm donuts…love the vellum overlay with the sentiment! DONUTS! I love me some donuts! haha. This is such a fun card! Love the embossed sentiment on the vellum too! I love everything about this card, and I even don’t like donuts at all (to sweet for me!) but these colors make me drool! Love this ‘sweet’ card, Therese! Your videos are always great to watch, and it’s nice to see your process. Those doughnuts are just fun. Great card. This is so delicious!! Love all the different decorating stamps that come with the set. I love donuts with pink icing and jam donuts. Unfortunately they only have donut shops in Auckland and Wellington but Dave is going to Auckland at the end of June so he will be coming back on the plane with many Dunkin Donut boxes…..yum! 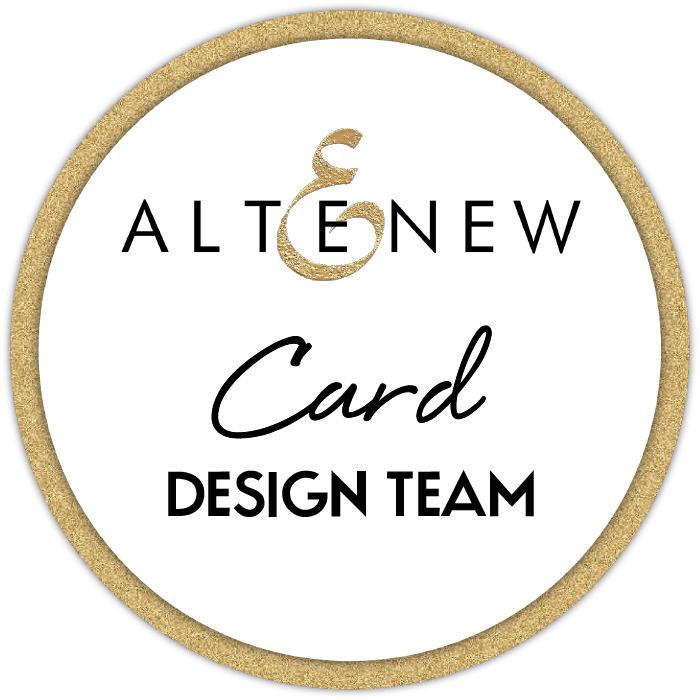 Delicious card! Love the vellum efektejä, have to try sometime.